Sticky is an app that will use its adhesive power to latch onto your heart and not let go. It was brought to us by Clickgamer.com, also known as the sellers of Angry Birds, so by default of reputation you know Sticky must be a fantastic and utterly addictive physics-based gaming app. You can use the app on an iPhone, iPod Touch, and iPad and it costs $0.99. Sticky is a little, gooey, orange ball that is the product of scientific research gone awry. He is loyal to the scientists who accidentally created him and is their only hope when toxins try to take over their enclave. 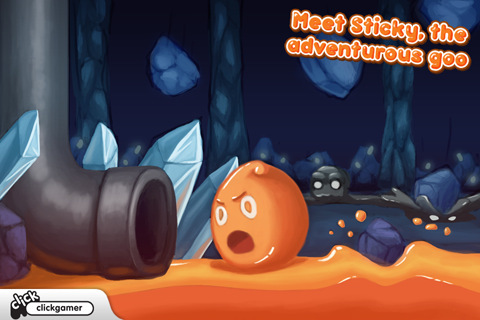 You start out playing with Sticky in a cluster of levels called Lush Caverns. On the left side of the screen is a sewage-like opening that toxins pour out of. Once in the cavern they make their way across the screen into the other opening and it is Sticky’s job to stop them before they get there. To play the game, you have to wind Sticky up in the right direction and fling him onto the toxins to kill them before they escape. You do this by pressing Sticky with your finger and turning it to create a dotted line that will become the pathway Sticky takes to get hurled at the toxins. With each set of levels the toxins get larger, more numerous, and altogether more intense. With the bitter comes the sweet and although the toxins get more menacing, when Sticky offs them he gets their powers. Periodically, the scientists check in on him and notify him of new dangers and ways to exploit and steal the toxin’s powers. At the completion of each level you get a rating in stars of whether you did well or not. If you want to take a look at the toxins you have encountered so far in your game play, you can visit the Toxiary section of the app to get a rundown. This may be hard to believe, but playing Sticky is a real challenge. The orange ball sticks to just about everything, so using the scrolling shooter to catapult him toward a toxin is an acquired skill that takes time to work on. Sticky is loads of fun on the iPhone and I recommend it to everybody. AppSafari review of Sticky was written by Vanessa Paszterko on March 17th, 2011 and categorized under App Store, Fun, Games, Line Drawing, Physics Based, Scrolling Shooter, Time Management. Page viewed 4382 times, 1 so far today. Need help on using these apps? Please read the Help Page.